Mike O'Connor grew up outside of Pittsburgh, Pennsylvania. He attended the Pennsylvania State University, where he received his Bachelors and Masters degrees. Mike moved west and received his Doctorate of Veterinary Medicine degree from Washington State University in 1985. For the past 30 years, he has practiced in Sonoma and Marin counties and was instrumental in instituting modern dental equipment as a standard for the practice. 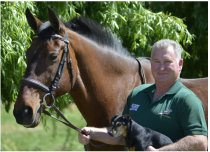 Mike has a strong passion and commitment to sport horse medicine and dentistry. 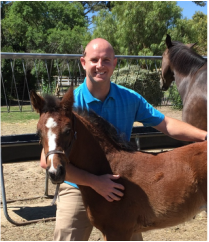 Nathan Keefer has practiced veterinary medicine in Sonoma and Marin Counties since 2002. He was raised on his family’s dairy farm in Indiana and received his B.S. in biochemistry from Indiana University. After moving to the west coast he attended Oregon State University where he earned his M.S. in microbiology and his D.V.M. Nathan relishes the challenges of day to day practice, especially the variety of both common and rare emergency cases in horses, cattle, small ruminants, camelids and even occasionally swine. Nathan particularly enjoys practicing preventative medicine with a focus on dairy and beef herd health, bovine reproduction and strategies for transition into, and success in organic dairying. In his time away from veterinary medicine, he is devoted to spending time with his wife and 3 daughters, eating, cooking and enjoying the great outdoors. Sean grew up in Bishop, Ca where he developed an interest in animal husbandry while raising pigs in 4-H and showing western horses. He completed all of his school at UC Davis and graduated with a Doctorate in Veterinary Medicine in 2014. The following year was spent as an intern at Steinbeck Country Equine Clinic. Sean joined SMVS in July 2015. His special interests include internal medicine, ophthalmology, and lameness. On his off time, Sean enjoys fly fishing, swimming, running, and a good cup of coffee.